Do you have a fantastic Rottweiler photo or two that you would love to share with the world? Who doesn't like to share their Rottweiler photos with the world? Just think how many people will be ooohing and awwwwing over your fur-baby? 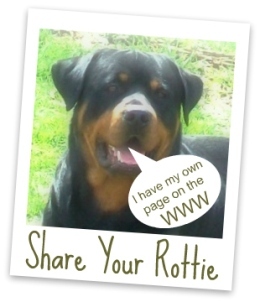 About 20,000 people visit Rottweiler-Facts-and-Info.com every month! A lot of those folks want to see what other peoples Rotties look like! . . .You can share your baby right here with them. Learn everything you need to know about this awesome breed of dog, what to expect, how to care for your new baby, and so much more! Rottweiler Puppies - Take a look at one Rottweiler puppy as he grows from 6 weeks to 1 year. Discover what learning stages he goes through and why. Also learn how deal with each of those stages. Rottweiler Health - Learn what specific health related issues you need to be aware of and how to keep your Rotties as healthy as possible. Show Off Your Own Rottweiler Pictures! It's really easy to upload your pictures to my site, and tell me a little about you and your Rottie. Your dog will have it's own page, and I'll add your photos to my gallery too. I love to show off my own dog, and would love to show off yours too! Your story will appear on a Web page exactly the way you enter it here along with your Rottweiler pictures. Just click the button and find the first picture you want to upload on your computer. Select it and click on the button to choose it. Rescue Rottie needs a name! This is my third rescue Rottie. . . Just 9 weeks old. I haven't named her yet… suggestions? This is my good looking Rott, Bruno! Do you like him? Fun Times with my crew! This is my 24 month old Rottweiler named Lucy. She is my naughty but loyal baby. This is my Rottweiler puppy named Shadow, and we live in Sri Lanka. I just have one thing to say. . . Rotties are the best! Diamond was born on Christmas morning! She is 19 months and weigh 81 pounds. She is the love of our family lives! American pure-breed Rottie. Three months old. Four year old American rottie. Parvo survivor. She is the one who makes me happy and feels me to be in other world. We rescued Magnum from the SPCA just 3 days before they were going to put him down. Our beautiful Mia!!!! We rescued her Dec 2010 and she has been the best dog. She manages to bring a smile to my day, everyday!!! Hi, this is kovu, my beautiful 17 month old boy. He loves everyone and everything. He is so soppy and is like a big cuddly teddy beat. This is our female Rottie Athena, who 13 weeks old. She sits on our rocking chair waiting for us, as me and my wife sit on it when we throw her toy. He's very cuddly and friendly. Nice to other pets except cats. 8 months old. Neela was 8 weeks when we got her, and our first picture of her is with my son and her at the petstore where we first fell inlove with her. Aged 7 weeks. 1st day at new home. Trucker is 8 months old and Samantha is 2 months. I love big dogs. This is my 3 year old Rottie. . . His mom is a Rotterman and dad is rottie. Cosmo is a rescue and the best friend I could ever have! This is my 8 year old male Rottie Denali. He was my daughters best friend and dress up buddy! Maximus is my first Rottweiler, I just adore him! He likes to play hide & seek, and jumps in the shower with me every morning. I am Corporal Long of the US Army. . . .Bear is my Best Friend! Cross is the name of my Rottie, and is 2 years old. Cross and I live in Nigeria, in Africa. I absolutely just can't do without Cross. This is my sweet 2 month old female Rottweiler puppy named Browny. Return to Rottweiler Pictures Gallery This is my Baby boy out in the yard where he loves to be. This is a picture of my 2 month old Rottweiler puppy named Danny. My name is Joji, and Danny and I live in India. My little Rottie puppy named Tasha.